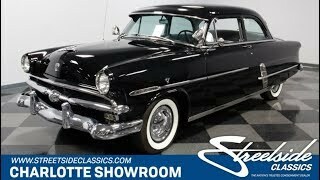 Hi, I am interested in your 1953 Ford Customline (stock #4881-CHA) listed on Autotrader for $24,995. I'd like to get more information about this vehicle and confirm its availability. This 1953 Ford Customline is period correct where you want it (like the slick black exterior); upgraded in the best places (like the A/C interior); and offers serious added power (with a 302 V8). And best of all, this total package is available right now for a terrific price. Ford had a great-looking style in 53. The well-proportioned sheet metal was given serious flair with all the added bright work. The revised grille was so wide that it reached around the corners just like the bright bumper below it. The side trim is complete on everything from the streak that runs along the fender and door, to the line that runs around the base of the windows. Not only is this all complete, but youve got great upgrades like dual spotlights and a windshield shade. Its all wrapped in glossy application of the factory-correct Raven Black. But not only is the black adding to the premium feeling, it also gives this Ford some sporty attitude. Its hard not to feel like piloting a rocket ship with the sleek profile aided by fender skirts, and a tail end that had jet-inspired afterburners for taillights. All of this is period-correct, right down to the whitewalls and bright factory-style wheel covers. Inside is a custom gray interior that trades in all the vinyl for comfortable cloth. But even with this upgrade, this design has a great 50s look that will keep you loving this vintage ride. The same goes for the classically thin wheel with Ford family crest in the center. But more than just a great classic appearance, this one has been upgraded to be a terrific all around cruiser. Thats why you have an AM/FM/cassette radio and cold-blowing air conditioning. Under the hood is a Ford legend, but a much younger and more powerful one than the Flathead that was available in 53. Its a 302 cubic-inch V8 thats been given some extra flair with the bright valve covers and a matching air topper. Plus, we have a large maintenance receipt from 2016 that includes the addition of a Holley four-barrel carburetor. This upgraded package idles nicely and makes a sweet sound from the glass-pack dual exhaust. But more than just a great power plant, take some time to look over this full build. Youll see the upgrades like the front sway bar, three-speed automatic transmission, and front disc brakes. It makes this classic Ford a great all-around cruiser. When you can find a classic that has been upgraded in all the best ways, and its turn-key ready right now for such a nice piece... well, then you know you need to hurry to grab this deal. Call now!